Amit Shah reaches out to seers for Kumbh mela, Hindutva and second term of Modi Raj. BJP President Amit Shah meets seers, visits temples in Prayag Raj to link Kumbh and Hindutva for upcoming 2019 Gen Election. 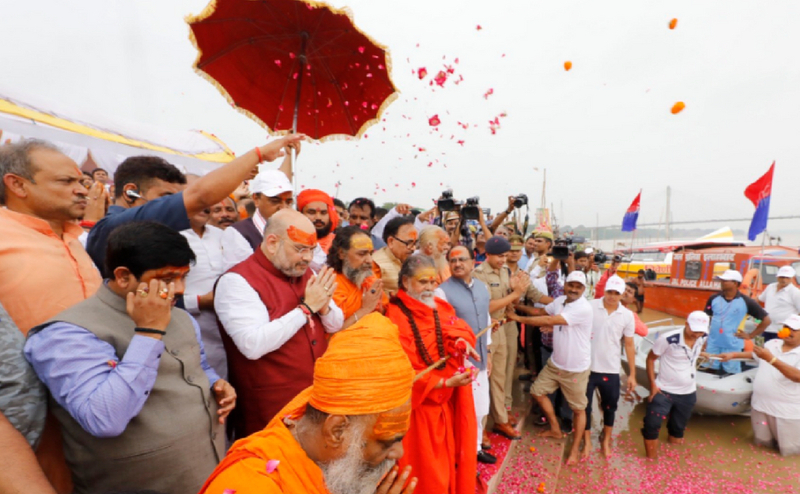 Upendra Bharti | HENB | Prayag Raj (Allahabad) | July 28, 2018:: In the holy day of Guru Purnima on Friday, BJP national president Amit Shah met with seers and ascetics in Allahabad, inspected Kumbh preparations and offered prayers at temples in the district. The Akhara Parishad, the apex body of ascetics in the country, besides several political leaders, have been of late strongly demanding that the name of “Allahabad” be changed to “Prayagraj”, with the grand Kumbh Mela slated for early next year. Shah, however, did not give any public statements. The visit of BJP National President to Allahabad had greater significance to connect Hindutva link with BJP in the upcoming General Election in 2019. Shah visited the Hindu shrines viz. Siddh Baba Maujigiri Mathh, the Panch Dashanam Juna Akhara and the Bade Hanuman mandir on the Yamuna banks. He then visited the All India Akhara Parishad’s headquarters at the Baghambari Mathh in the city. Earlier, chief of Akhil Bhartiya Akhara Parishad, Narendra Giri, told HENB, “We have been assured by the government, including the chief minister, that before the upcoming mela, Allahabad would be given its original name ‘Prayag’. We have been informed that all the preparations have been made and the name change would be done after a cabinet clearance.” On Friday, however, he could not be reached for comment. Earlier, the state cabinet had cleared Rs 5 crore to the four Akharas to upgrade infrastructure ahead of the Kumbh. From a reliable source, it is also revealed that Shah assured the saints and seers of Prayag that the next BJP Govt would fulfill its promises for nationwide ban on cow slaughter, 100% cleaning Ganga-Yamuna rivers and completion of Ram Temple on priority basis. Notably, the Akahada Parishad and the saints had put their seal on the name of Narendra Modi as BJP’s prime ministerial candidate at a Dharam Sansad held during the 2013 Maha Kumbh at Allahabad. Political pundits, however, believe that 2019 Kumbh mela coinciding with general elections will offer BJP a big opportunity to connect with a huge and diverse chunk of majority Hindus of the country. With this Allahabad visit on Guru Purnima, Amit Shah sought the blessings of Saffron to ensure second term of Modi Raj in 2019. The RSS has already communicated to the Yogi Adityanath government in Uttar Pradesh and its sister concerns to host the Kumbh on a scale like never before. That’s why the BJP government in UP has already decided to send out Kumbh invites to all the 70 lakh odd villages of the country, government officials confirmed. So, not only did Shah collect the feedback from the saints and seer on the preparations for the Kumbh Mela scheduled for January 2019, Shah also discussed the strategy for the big battle of 2019. Shah instructed the BJP leaders and workers around Allahabad and eastern Uttar Pradesh to make a planning to join the Kumbh Mela to spread the message of BJP’s Hindutva to the crores of pilgrims to come to the biggest Hindu congregation in this world. Going to a balance of 50:50, BJP has now opted the policy of trumpeting the development along with playing Hindutva card whenever necessary. Now, BJP can’t ignore the Hindutva vote bank in a majority politics as culminated from the public reactions out of minority appeasement policy and Muslim vote bank politics. In this context, Amit Shah did not reach out to saints and seers of Allahabad this Guru Purnima not only for seeing the Kumbh mela preparation; he reached there with a Hindutva agenda to ensure a second term of Modi Raj in 2019, obviously. BJP and Hindutva has set an inseparable identity in Indian politics, but problem arises when some cranks in BJP want to defy Hindutva idealism to uphold Development agenda in a very ridiculous way. They do not want to understand that Hindutva is the best way of development and the key to every solution for Humanity.